On behalf of the Sakyong, Jamgon Mipham Rinpoche, the Office of the Kalapa Court wishes to announce the formation of the Shambhala Monastic Order. 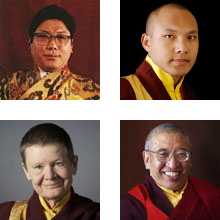 This is the fruition of years of work by the Sakyong and Gampo Acharya Pema Chödrön. The Shambhala Monastic Order will provide the umbrella organization over Gampo Abbey and any future monasteries within Shambhala. The Sakyong will be working with Ani Pema, Gampo Abbey’s monastics and other acharyas, the new shastri in residence and its new director on the path of Shambhala monasticism in the coming year. This development will embrace the monastic practices and traditions to which the monastics of Gampo Abbey have already devoted themselves, and which will be preserved. What will now be developed are teachings, practices and skillful means that further enrich and infuse the monastic discipline with Shambhala vision and culture. The Sakyong intends to provide teachings on Shambhala monastic culture, which is dear to his heart. The Leadership Council of Gampo Abbey wishes to express their delight with these new developments and looks forward to working with this vision.